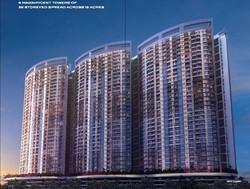 This is a Underconstruction Project in Kharghar sector 35. Luxurious project by Paradise Group. Our 1 Room Kitchen Flats herald you into a new chapter of life. It is a perfect abode that encompasses choicest of the amenities, locational advantage and solicitous planning. If you are searching for a 1 Room kitchen apartment, look no further: Siddhi vinayak Builders & Infrastructure Developers is the solution. We are the preferred investment choice and offer you myriad of amenities. We have developed a grand complex of more than 15 buildings that are residential and are employed with earthquake resistance RCC design and well designed streets. Further, the external walls of these buildings are sand finished and are painted by 100% acrylic paint, and a grand entrance gate for the complex. 3bhk flat for sale in Thane nearby malls market school park amenities 2ample parkings Top floored mountain view Road facing 24hour water supply etc. It's a investor flat in new ready to move possession. - Built-up Area: 1, 90, 814 Sq.Ft. Abhishek Enterprises has become a home builder in Navi Mumbai, solely due to their insight of developing excellent properties in and across Navi Mumbai and adjoining areas. We are providing studio apartments(300Sq.Ft. ), 1 BHK(550Sq.Ft. )as well as 1.5 BHK(675Sq.Ft. )Flats.Our Lifestyale features are lavish interiors with european panelled doors and french windows.Luxurious bedroom with wooden flooring. It sits right opposite to the Lions Club on Kacheri road, Palghar, with commercial shops and office space on the ground floor and residential flats above. An exquisite residential project built new wave of innovation in the real estate world. Customer centred approach and the utilization of space make it one in a kind. Magnificent ambiance and comforting conveniences elevate the living experience.